TILLAMOOK, ORE. — Tillamook County Creamery Association, a 110-year-old farmer-owned dairy cooperative, is unveiling its first major logo and packaging refresh in more than 60 years. The brand, which offers cheese, ice cream, yogurt, sour cream and butter, has launched more products in the past four years than in the four decades before. Rapid national expansion and product innovation have fueled more than 60% growth over the past five years. Tillamook Creamery generated $800 million in sales in 2017, up from $477 million in 2012, when Patrick Criteser joined the cooperative as president and chief executive officer. The latest addition is slated to debut in March. Tillamook Cheeseboard is a line of premium snack packs featuring cheese, crackers and fruit spread. Varieties include Sharp Berry Crunch, with sharp white cheddar cheese, marionberry spread and rosemary crackers; Spicy Berry Bite, with Pepper Jack cheese, marionberry spread and multigrain crackers; Smoky Apple Crisp, with smoked medium cheddar cheese, apple spread and olive oil crackers; and Sharp Strawberry Heat, with sharp white cheddar cheese, spicy strawberry spread and rosemary crackers. The products will launch in select markets, including Portland, Ore.; Seattle and Spokane, Wash., and Denver. The product line was designed to be savored or shared — not devoured on the go like many other snacking options. Consumers play a central role in research and development at Tillamook. The recently launched Sauce Starters line was inspired by a comment from a participant at a focus group. The just-add-milk cheese sauce mixes include seasoning blends and feature varieties such as creamy alfredo, aged cheddar, spicy queso and three cheese. “We have a range of ways of engaging with consumers as we develop products,” Mr. Criteser said. “In some cases, it’s the more typical focus group structure or setting. We also spend time with consumers in their kitchens or in their gatherings with friends in their living rooms. We also invite them in to one of our R.&D. facilities or offices and ask them to taste and give feedback and cook with a product. To that end, the company identifies opportunities to offer everyday convenience and a premium experience in traditional dairy product categories. 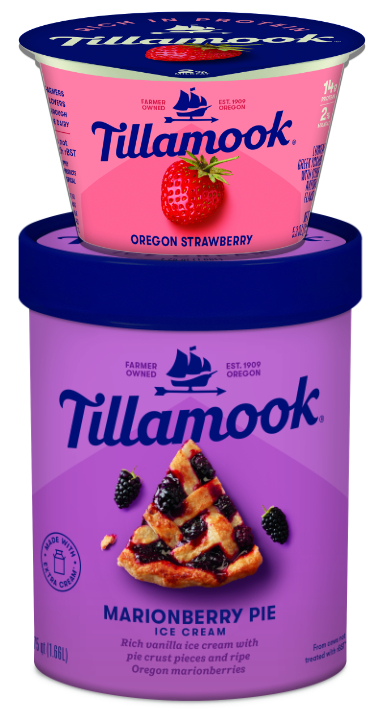 Tillamook partners with other Pacific Northwest companies to create ice cream flavors such as Pendleton Whisky & Maple Frozen Custard and Stumptown Cold Brew Coffee Ice Cream. Yogurt varieties feature locally sourced fruit, including Oregon blueberries, Washington raspberries and Hood River pears. And while many brands have pivoted to meet demand for plant-based food and beverage products, Tillamook does not plan to introduce any such products in the foreseeable future. As for the new look, which shoppers will begin seeing in March, clean packaging with an approachable, bold design features a new wordmark and logo inspired by a 1950s emblem.